There is no more distrusted aspect than the opposition. New students often look at oppositions in charts and shudder, or just sigh and give up. They assume those planets can’t possibly be compatible, they have nothing in common. It’s assumed that the two planets are completely at war with one another, and will never connect. Synastry brings out the worst of assumptions about oppositions, that an opposition formed between two charts dooms those planets in some way, forcing the couple into a lifetime of power struggles, arguments, and misunderstandings. Part of the problem is the way oppositions have been portrayed in many ‘cookbook’ astrology texts. I’ve seen even the most innocent of oppositions, Venus/Venus or Moon/Venus, given an interpretation that would put off a goth. It’s time to reclaim the opposition. In mathematical terms, the opposition is the second most powerful aspect, after the conjunction (Surprised you, didn’t I? Bet you thought it was the square.). The ‘two’ comes after the ‘one.’ Dividing the circle by two gives us 180 degrees. The opposition relates to whatever alien ‘out there’ must be integrated. The energies of the two planets involved must be acknowledged, processed, and learn to act as one. No matter how strange the interaction must seem, it has to happen. Within a chart, there will be a natural give-and-take between the planets. The trick to understanding these planets is in knowing that they are ‘natural’ partners. Usually, they are in complementary signs; the one facilitates the understanding of the other via their function in the signs, even though the road may be rocky. They are often like characters in a bad romantic comedy; though they ‘fight’ with one another, you know they will get together in the end, given enough time and circumstance. They may never totally agree, though they will have fun (and aggravation) trying. With out-of-sign oppositions, the plot gets thicker, and the road to one-ness is rougher, but happen it must. Oppositions work via a see-sawing effect. If it’s not weighted towards one end, the opposition can vacillate, one day embracing one end, the next, the other. This give-and-take can happen when oppositions are formed between charts, and they can often drive us crazy. If we have a Mars/Pluto opposition between us, one day my Mars might be the victor, the next, your Pluto will win control. Planets in opposition armwrestle in a pronounced way. Power is turned over quickly, without warning, leaving the participants confused. Troubles occur when one planet has the upper hand over another, whether this happens natally or in synastry. If it’s my Sun, Moon, Ascendant ruler, dispositor of the Sun, a ruler of an angle, or if the opposition is weighted by an outer planet, the conflict may seem more intense, because the ‘weightier’ planet will win out. That planet will have its own way, the house involved will have a stronger imprint, and the lesser planet will either have to fight for recognition or come to some compromise. This is difficult when it’s a planet like Venus, which has much to do with our sense of self-worth. When Venus is involved in an opposition, it’s values are challenged. If there is a Venus opposition, we find ourselves being tested regarding our sense of what we own, internally or externally. Venus/Pluto will do this by engaging us in power struggles; Venus/Uranus, by tearing away what we possess, Venus/Neptune; by idealizing what we (may or may not) have and then having it disappear, without explanation or recompense. No matter what opposes it, Venus has to both hold on to its values and allow growth according to the outer planet. Squares to any opposition will aggravate the tension. If a planet is trine/sexile an opposition, it will act as a diplomat, syphoning off the see-sawing energy and allowing both planets easier expression through its position. The key to the opposition lies in the fact that each planet is on the other planet’s polarity point. The key to the opposition lies in the fact that each planet is on the other planet’s polarity point (i.e., directly opposite the planet). The polarity point of a planet is a vulnerable place which indicates what most needs developing in that planet. Oppositions, in fact, are a blessing, because they tell us exactly what those planets need in order to be stronger, to be whole. If Venus is opposite my Pluto, both Venus and Pluto need adjustment. Venus’s values, tastes, and preferences will be challenged by Pluto’s compulsion towards the ultimate truth. Pluto’s obsessive search for the ultimate will be guided by Venus’s love, its values and its aesthetic urges. If successful, both ends of the opposition will alter. Polarity points show us what is missing in the planet’s expression. If my Cancer Venus is opposite a Capricorn Mars, the self-sufficiency that Cancer Venus needs to learn (via the opposite sign) will be helped by practical Mars in Capricorn actions. Venus will be able to ‘learn’ its Capricorn lessons via Mars activity. If Jupiter is there, rather than Mars, the Cancer Venus will need to experience an opening towards achievement, and to getting itself ‘out there.’ It will need to learn how to go about life in a practical and yet adventurous way. The opposition is striving for wholeness, much more so than any other hard aspect, and is much more capable of success in this area. In a natal chart, with a little work, these two fighting elements will add up to greater than the sum of its parts. If the opposition occurs between charts, the energies of the two individuals may collide in some way, but with luck, each will help the other to achieve what could not be achieved before the interaction. For example, sticking with Venus, if my natal Venus in Cancer is made vague somewhat by a natal contact with Neptune, someone who comes along with Venus in Capricorn opposite my Venus may set me straight about the practical goals I need to achieve in order to feel self-sufficient and grounded in my own tastes and desires. Sometimes, oppositions created between charts are involved in what I call, “hungry planet syndrome.” This occurs when a planet in a natal chart is primed for growth, due to transits and progressions; it knows it has somewhere to go, but it doesn’t know quite where yet. If someone comes along with something to oppose that planet, that planet may think that the new person is the be-all-and-end-all of existence. It can result in intense obsessions, fascinations and compulsive relationships. It can also be related thematically. For example, if my progressed Ascendant is conjunct Neptune, and I’m primed to experience all things Neptunian in my life in order to elevate that planet’s expression in my chart, I may fall into an obsessive relationship with someone whose Sun is opposite my natal Neptune, or whose Neptune is opposite my Sun. 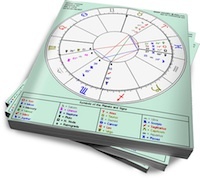 My interaction with that person will be highly Neptunian (fascination, illusion of perfection, surrender), and the Neptune lessons will influence the entire chart, as indicated by the progressed Ascendant. The most challenging and strongest – but most rewarding – oppositions are between the higher and the lower octaves of planets: Mars opposite Pluto, Venus opposite Neptune, Mercury opposite Uranus. These oppositions are the fast track to spiritual development, and while they are difficult, either natally or between charts, they can hold unimaginable rewards. I’m very pro-opposition, whether I see it within or between charts, because I know that there is a direct path to integrating two potentially opposing elements. Natally, the two planets in an opposition have a dialogue, they are talking to one another. The opposition shouldn’t be confused with the quincunx (150 degrees), which argues with itself to no good use and is often a real challenge, spiritually, mentally and metaphorically. In synastry, the opposition creates a unique circumstance for positive development, no matter how painful the initial encounter. The next time you see an opposition in a chart or between charts, be brave. The debates are open and the translators are at the ready. This post was originally published at The Inner Wheel, and is republished by permission of the author. Opposites Attract, But Are They Actually Compatible? Wow, this is amazing to me. A rather intense relationship I was rcently in, invloved my pluto opposite his mars, my neptune opposite his venus and my uranus opposite his mercury. His mars/merc are in Pisces and his venus was in Taurus. Although we are no longer intense the whole thing feels like obsession but also like being a yo-yo. And it’s all very complicated since other people are involved. However, I know what I feel, but what do these oppositions mean for/to him? Those are three very intense oppositions for a very good astrological reason: each outer planet is matched with its lower octave. Mars is the lower octave of Pluto, Venus is the lower octave of Neptune, and Mercury is the lower octave of Uranus. Since the outer planets are all yours, the pressure on the other person to grow and make changes would be enormous, and perhaps rather uncomfortable, if he wasn’t ready for them. Much depends on the rest of the synastry, but there is a rather hypnotic fascination regarding these positions which touches on every aspect of mind, heart and soul. Not an easy energy to live with. It would take a tremendous amount of maturity to handle this well. Fascinating stuff, it makes so much sense. I have been in a addictive relationship for 16 years, and it’s taken us this amount of time to begin to straighten ourselves out with a view to living together. I am Taurus, he is Cancer, and we both have Venus in Gemini. It’s terribly intense but we are finally learning how to communicate. Thanks so much for this article, it’s really helped. Thanks Dawn, I will try. It’s not an easy one, but we are both lucky to be able to see the comedy in it! Well some of our synastry was pretty good, I think but lot’s of other oppositions, as well. Both have moon opp mars, not a good one but we did ok. My moon opposes his sun, as well. But our suns are trine our jupiters which is good and our mars trine each other as well as our moons, neptunes both trined moons and my neptune trined his sun. It was an unconventional relationship so tough to tell how these oppositions would have played out if it were just the two of us. His Cap moon keeps him grounded and VERY mature as does my Virgo moon, but I can see how all my Virgo planets opposing his Pisces planets cause me to dig for answers when he would prefer to be evasive but has forced him to open up. Neither one of us can completely let go even when we both say it’s over so I have to agree with your fascination statement. Great article! I never really believed oppositions were as horrible as everyone always seems to make them, and this supports that thought. Currently, it would seem that our Uranus opposition is taking its toll. Not sure how we’ll come out of that one! This is such a great read, thank you for writing this! Also noticed how some of the most impacted relationships or friendships I’ve had with men in my life do have: Mars opposite Pluto, Venus opposite Neptune, Mercury opposite Uranus. really cant say anything good about natal SUn opposite Saturn. although i wouldn’t want to excise it necessarily. i wouldnt feel like myself (sun) if i werent miserable (saturn). So a personal planet opp an outer is ok but what about moon opp moon, or other personal planet opp the other’s? I have a friend with moon opp moon synastry & her venus square his mars and she seems to think he’s ‘the one’ for her. Oh but her moon trines his sun, so maybe he can do no wrong. 😉 He is nothing like ‘her type of guy’ but the attraction seems pretty deep. This new approach to ‘difficult’ aspects is refreshing because I’ve known many people who had nothing but harmonious aspects and it never lasted. Think some difficulty keeps things interesting. Boredom becomes a bane of a long-term relationship. It makes *me* so sad. be glad you have had enough square and oppostional energy to work for what you most need in life. However I have, myself, many oppostions in my own chart! Not only that, but they are almost all “important” planets. For example: Sun oppose Moon, But–my Sun is *conjunct* Saturn and to a lesser degree, Neptune.So, obviously my Moon is oppose those 2 also. My Sun however, is in late degree Libra, and my Moon is not Aries, but early degrees Taurus. My Saturn is 0 degree Scorpio. I often thought my Moon in Taurus, (in its exaltation) and in a sign also ruled by Libra, might make the oppoistion easier.Or, do you think it is harder because it is an oppostion out of sign? Btw, my Jupiter trines my Sun and Saturn so, I imagine there is relief there. Speaking of Libra- type aspects too..I have Cap rising…but @28 degrees. So, my 7th Hse is only 28 degrees Cancer–the rest is Leo. *Pluto* in Leo, (of all things) is in my 7th Hse. So, while it doesn’t oppose my Sun or Mars or Ascendant, it is “oppostional” in a way, in partnership and marriage.Or am I incorrect? I too focused on synastry for years and had many many love affairs. Many were obsessive and addictive, some not. With my Pluto, I was catalystic (or so it seemed) in my relationships- big transformations always happened for the other person and for me. I didn’t look into my own chart as much for years as I was busy with who I was doing what with. Mostly am wondering how all my natal oppostions figure in my life, especially since some are out of sign and some aren’t. Great article! Very in detail! That’s exactly what I’m doing now, trying to work on improving myself to be a better person by overcoming the challenge I need to face that was stated on my natal chart. I have four oppositions to work on. It may be hard but it doesn’t hurt to try I guess.